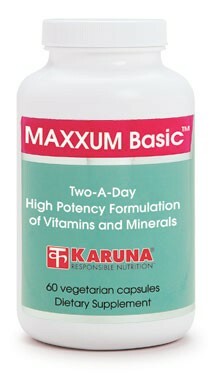 MAXXUM Basic contains every known essential micronutrient in amounts that, combined with a typical Western diet, will meet or exceed daily requirements for most people. B-complex vitamins are supplied in generous amounts above daily requirements. Bulky minerals calcium and magnesium are supplied in amounts to complement dietary intakes. Vitamin K is present acknowledging important new insights into the physiological roles of this versatile nutrient. Two-a-day dosing helps assure patient compliance. Suggested use for adults: Two capsules daily, with meals, or as directed.